Do you know this Sindarin Elf of the Woodland Realm? Action figure right out of the Lord of the Rings films! Features an authentic and detailed likeness of actor Orlando Bloom as Legolas. Includes multiple hands, Elf knives, a bow with arrows, a quiver, and more! This Lord of the Rings Legolas 1:6 Scale Action Figure is right out of the Lord of the Rings trilogy. 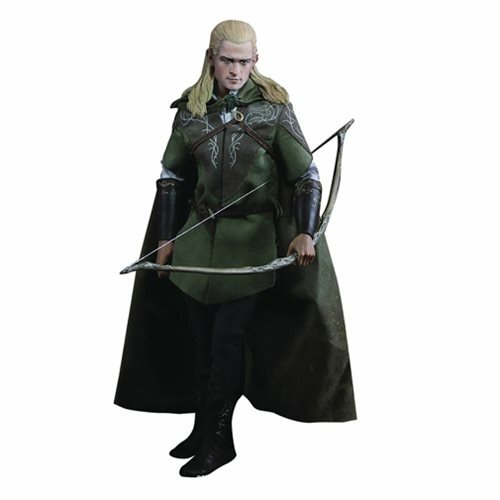 The Sindarin Elf of the Woodland Realm features an authentic and detailed likeness of actor Orlando Bloom as Legolas, stands over 10-inches tall, and includes over 32 points of articulation and a detailed cloth costume with film-accurate weapons! Complete the set with the previously released Thranduil action figure (sold separately). Ages 15 and up.